PROS: It has talking caller ID and talking dialing feature. It also has a high level of amplification at 50 dB amplification on incoming sound and 95 dB level amplification on the ringer. It features huge buttons with a high-contrast screen that is helpful for users with low vision. CONS: The phone doesn’t have an answering machine. The setup may be too complicated for some, but if you get a unit that is ClarityLogic enabled you can get help with the installation. SUMMARY: The Clarity XLC3.4 is an excellent cordless phone to assist people with moderate hearing loss to communicate with friends and family. It isn’t the least expensive of the cordless phones, and if you need additional handsets they can be relatively costly (around $65), but for the level of amplification and the sound quality you are getting the potential improvement to the quality of life, this cost is worth the additional price. 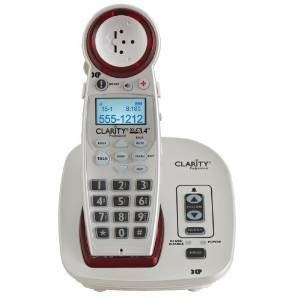 The Clarity XLC3.4 Amplified Cordless Phone is a popular option for anyone with moderate hearing loss. Several cordless phones will amplify sound, but most don’t give you the level of amplification that this phone does. It also has several other great features that are helpful for anyone with hearing as well as visibility issues, such as large, easy-to-press backlit keys, hearing aid compatibility and caller id that announces who is calling. If you are shopping for a cordless model you want to make sure it has DECT 6.0 technology, this is especially important for users with hearing loss. DECT 6.0 stands for Digital Enhanced Cordless Telecommunication, so it is the latest digital technology that you can get for a cordless phone. It makes sure your calls are secure and private, and it also help avoid interference with other wireless devices while providing clear, high-quality sound. This Clarity phone uses DECT 6.0. Another highly significant feature to look for on an amplified phone is the ability to customize the sound experience. This phone allows the sound to be tailored not only by changing the level of the sound but the tone and pitch as well. The XLC3.4 has four tone settings for a customized sound level as well as a boost button that will increase the amplification level. As well as offering amplified call quality and loud, easy-to-hear ringtones, the phone has big, high-contrast backlit keys that are easy to press. The phone announces who is calling and which buttons you’re pushing (which you can turn off if it bothers you). The unit can make and receive calls even when power thanks to its dual power battery backup that is included with the unit. Expansion headsets are available separately, and you can add up to three expansion sets. Compared to very popular Panasonic KX-TG6592T that is marketed as an amplified phone, the Clarity XLC3.4 gives a much higher amplification level at around 50+dB for incoming speech and up to 15 dB for outgoing speech. The amplification on the outgoing speech is helpful for users with a quiet voice who are often asked to speak up when communicating on the phone. The extra loud ringer can be set to 95 dB, to ensure that no phone call is missed. As with a lot of products to help amplify sound, this phone can be a bit hit or miss as far as the sound quality. In a lot of cases, finding the right phone for a particular persons hearing loss can be a bit of trial and error. This unit gives you the option of customizing the tones to 4 different frequencies; you can also adjust the amplification level of incoming sound as well as the ringer to help find the right sound. If you find that you don’t like using the headset, the speakerphone offers loud and clear sound quality to allow you to have hands-free conversations. A stand out feature on the very latest version of the XLC3.4 is something called ClarityLogic. It is a unique blue button that connects your phone to the Clarity help center. This replaces the button with a red cross on previous versions of the phone. When you press the button and contact Clarity, their representative will be able to personalize and adjust the phone for you, even doing things like adding new numbers to your phone book. It is a wonderful option for the elderly who are having difficulty with the phone or anyone who needs help with specific features. Phone setup may be too complicated for some, but if you get a unit that is ClarityLogic enabled you can get help with the set.